It shouldn’t come as a surprise that Tusker is heading to Greenland in 2020. As one of the world’s least visited, most spectacular places it is the perfect destination for Tusker’s ever curious, always-open-to-new-adventure clients. Greenland is the world’s largest island with 75 percent of it covered by an ice sheet second only to Antarctica’s. With a population of just 57,000 it is the least densely populated territory in the world. Its landscape is mountainous and although just four peaks exceed 10,000 feet, they seem more prominent because they rise from the Arctic and North Atlantic Oceans. Carved by glaciers, myriad fjords are reached by unmarked trek routes some completely open to hikers and some only viewed by zodiac. For adventure travelers who seek solace, this is a land devoid of civilized noise. There is sound, the cracking and grinding of icebergs and the flow of drifting ice. You’re likely to hear barking seals, the call of the fulmar and less likely the polar bear’s bellow, or rare Arctic wolf howl. There are no native forests this far north and you will not see other trekkers on Tusker’s 11 day August 2020 trip into a backcountry that is virtually trail-less. 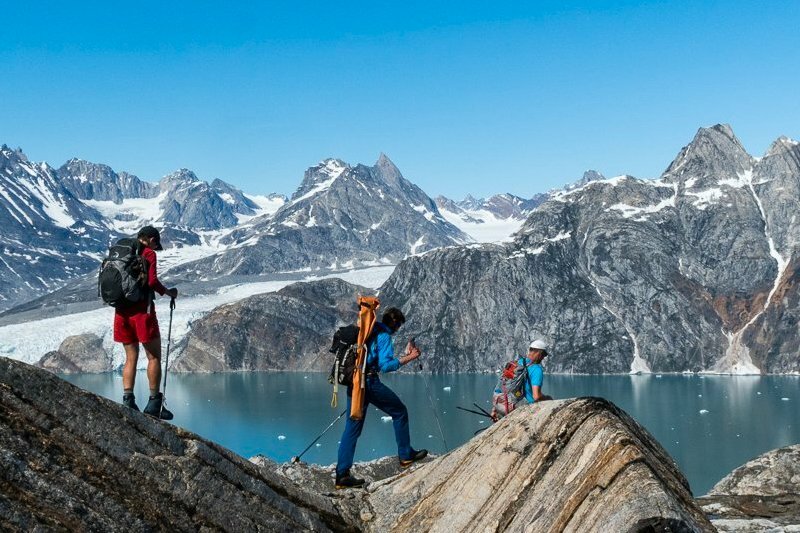 Raw, unfettered naturalness is the draw and Tusker’s founding guide Eddie Frank has designed an 11-day Greenland trek, hiking into eight different backcountry campsites that will expose you to some of the most pristinely beautiful scenery in the world. The trek meanders through the fjord’s and waterways of Greenland’s Southeast that has its own microclimates being an island archipelago. It requires boat connections to get to some camping locations and travel is planned around the tide charts. This trip will test your endurance. Hikers will cover six to ten miles per day over varying terrain that includes mountain passes with scree and other mountainous sections where there is knee high vegetation. 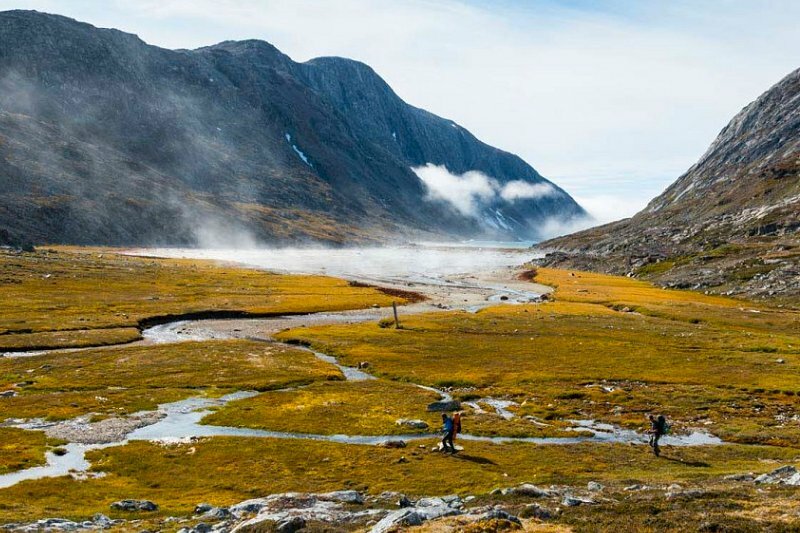 You will traverse beaches, moving rivers and rocky shoreline while camping in remote valley’s that rival Mongolia’s Altai Tavan Bogd National Park, which has been Tusker’s most pristine destination. Greenland may best be known today as a hotbed for climate change study. It’s a barometer of the world’s warming with 10 percent of the world’s fresh water supply frozen in its ice shield and glaciers. Meltwater runoff is increasing and this has major implications for the world’s sea levels and weather. For the adventure traveler keen on seeing the world’s last wild places, there should be a sense of urgency to see it now, yet Greenland is still undiscovered. Greenland’s foreboding remoteness between the Arctic Ocean and North Atlantic has kept it well off the travel map. Its isolation, 800 miles from heavily touristic Iceland, means less than 33,000 visit annually and of those less than 3,000 Americans go. More scientists come here than your rank and file trekker. This is a land with limited tourist amenities, with just one four star hotel in the entire country. Wi-Fi is limited so plan to get off the tech grid. Lack of connectivity hasn’t stopped the indigenous Inuit culture that has long survived living off the land and sea. With 2 million seals and nine species of whales including the world’s largest (blue whale) the Inuit continue to coexist with their frigid yet beautiful habitat. Tusker’s trip comes in relatively balmy mid-August and expect the sun to set around 10 p.m. and rise around 5 a.m. so adjusting to extreme daylight is not a big factor. You will need to be in prime hiking condition as there will be days with ascents of 2,600 feet and you will be shouldering a day pack that weighs between 20 and 30 pounds. This is a land of self-sufficiency so be prepared to help set up camp every night when the boat arrives carrying the camping gear. Knud Rasmussen, the son of a Danish missionary, imprinted Greenland on the world’s consciousness. He made the first of his seven Greenland expeditions between 1902-1904 and it produced his first study of Inuit life. His follow up expeditions would lead to his books that explored and defined the origins of the Eskimo race. Later he would establish the Thule Trading Station that was used by Admiral Peary and other polar explorers. The station is now a small town and is the world’s most northern commercial outpost. The sun doesn’t set here in the summer and the ice still is intact well into August in this hamlet of 700 hardy inhabitants. Yet despite Knud’s trailblazing Greenland still remains terra incognito. In a world that has been google mapped, Greenland has escaped the noisy caravan of industrial tourism. It’s a throwback to Knud’s era where there are more dog sleds than cars. There are still many unchartered places ripe for discovery. The island’s highest point Gunnbjorn Fjeld at 12,119 feet is seldom scaled because to get to it you need to be helicoptered in or arrive by ski plane. And that’s the way it’s got to be circa 2020 if you are going to truly have a wilderness experience. 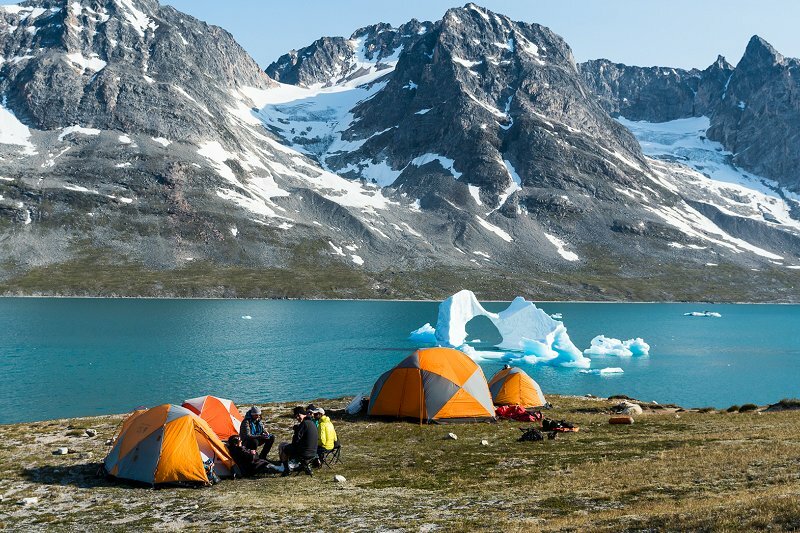 As Greenland’s ice sheet melts, you can’t escape the reach of civilization, but you can hike and camp in a place with just your new friends and only hear the crack of the ancient ice just as Knud did a century ago.